Posted July 1st, 2014 by Keely & filed under Asana. For the month of June, my teacher and I had the privilege of teaching a free Saturday morning yoga class downtown at Millennium Park. 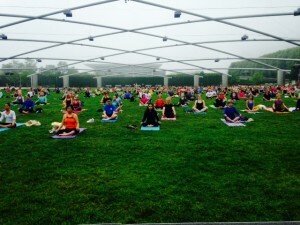 Lucky for Chicago’ans, the park district sponsors occasional free classes held on the lawn of the Pritzker pavilion. Every Saturday, with the weather on our side, hundreds of people brought their yoga mats and each week the amount of people seemed to grow exponentially. Everyone needs some quiet and stillness in their life. Our physical yoga practice is the time that we dedicate to work and stretch the muscles and physical body, so that the body can sit in stillness and be present. We each have an internal guidance within us that helps lead us to living the life we were intended to live. But we can only listen to that internal guidance when we quiet the mind and observe our thoughts without judgement. The Chicago loop is typically filled with so much noise and an overwhelming amount of congestion to try to navigate through. Hundreds of thousands of people walking rapidly from one work obligation to the next, cabs and cars honking aggressively at one another, and enough construction at every other intersection to drive anyone crazy. Living in an urban environment with 2-million people means constant visual and mental stimulation. Everything surrounding us serves as a distraction from that of one’s personal and internal experience. Add that to our constant connection to some type of portable technology device that ensures we are engaged socially to the rest of the world via the interwebs, and our time dedicated to ourselves is non-existent. Very rarely do us city-dwellers get to experience quiet and stillness outside of our homes. Yet early on Saturday mornings, the loop is quiet and somewhat still. Everyone fills into the pavilion at their own time, sets up their mat, and with a light melodic soundtrack in the background, gets to move through an accessible yoga practice. At the end of the practice and a short savasana, students are instructed to sit in silence for the last few moments and practice being present. Those last few minutes of the practice where hundreds of people are gathered in the same place and sitting perfectly still with their eyes closed, in the middle of Chicago’s Millennium Park is quite possibly one of the most amazing and humbling experiences I have ever felt as a teacher. The amount of energy and power that emulates from such a large gathering of people who are still and silent juxtaposed next to Chicago’s concrete jungle is truly fantastic. Yoga & Habits A great article about how yoga helps change habit patterns. Breathing & conversation Adam’s great post about the importance of grounding. © Keely Jones is powered by WordPress & Bones. Visual design and development by Adam Grossi.